Skirts can be a tricky lot—there's a fine line between marmy and cute or too short. 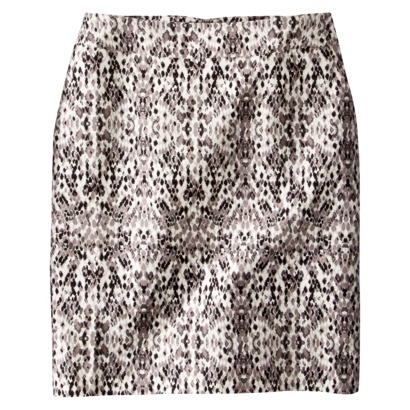 A patterned skirt like the one below can be useful because you can wear it with any solid top. 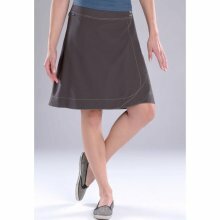 I also like semi-athletic skirts that are made of sturdy fabrics that hold their shape well. I think the Kuhl Lavanda skirt from R.E.I. (also available elsewhere--best price at R.E.I.) would take you from summer to fall and would look sharp with a lot of things and would be fine for a casual office. But you may want to think about dresses because they simplify things a bit: you don't have to match a top. The dress in the middle looks dressy on the model, but you can see that it's actually pretty casual and only $29.99, less expenisve than buying a skirt and a top. Tinley Road, carried by Piperlime, offers several cute, casual dresses.